Welcome back again for another Group Review of Oni Press’s Dream Daddy series! Issue #3, written by the Game Grumps themselves, Vernon Shaw and Leighton Gray, came out last week, and we’ve got some more thoughts. See previous reviews here and here! The title of this review The Return of Dadsona, because he’s back! And he looks completely different from the Dadsona in the first issue! What does this mean? How do you feel about it? Lisa: I LOVE the fact that Dadsona will apparently look different in every single issue (and since this has happened twice I sense it’ll happen again next time); that’s so keeping within the theme and spirit of the game, and he was handsome and goofy as always. Melissa Brinks: Agreed! Like I said in our first review, despite the fact that I have a Dadsona I played with, even he’s not really my “canon” Dad. An infinite number of dads dating an infinite number of dads. 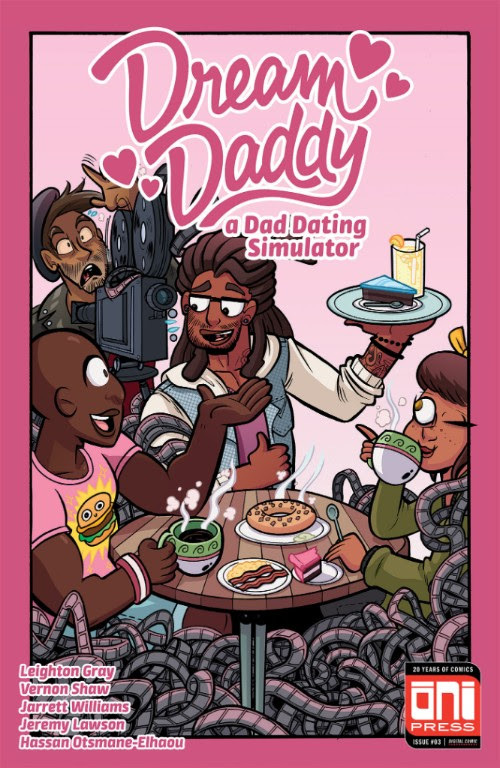 I like that there’s no “set” Dadsona because it allows everybody to not only imagine their own character in there, but also prevents the comics and the game from having any one type of person be the one we associate with the game. There’s no canon; everything is valid. Because Dream Daddy is one of the few games out there featuring queer men in a way that’s loving and kind rather than weird or downright offensive, I think it’s more important than ever that there’s no defined visual for Dadsona. Kate: Agreed. This is something we talked about in our first review, and I think it’s fantastic that instead of trying to have one Dadsona to rule them all, they’re creating a comics canon that allows for an infinite number of Dadsonas. If the series continues after these five issues, that really creates a lot of opportunities for different types of Dadsonas to be written into the canon. It’s kind of blowing my mind, to be honest. It’s such a simple solution for a complex transmedia problem. 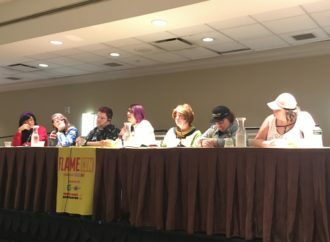 Alenka: I love the flexibility of Dadsona and how games like Dream Daddy allow the player to personally change up representation in the story. It was great to have my “default” idea of Dadsona challenged; as soon as I realized we were meeting a different Dadsona, I also realized that I’d considered the Dadsona we’d seen in the first issue to be THE Dadsona! It’s a creative tactic that lets them play with our idea of what is “default” and I love it. Amanda is also back! How much do you love Amanda in this issue? Melissa: Amanda is the best. I like that we got to see her struggle a little bit in this issue. 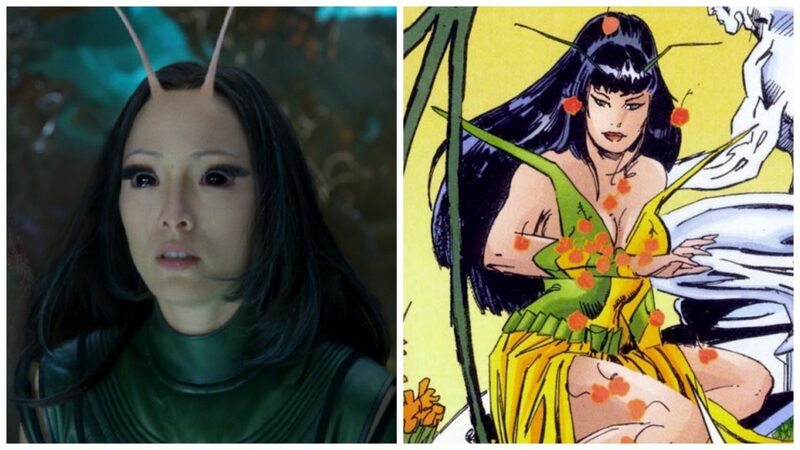 I love the girl, really, but she came off as maybe a teensy tiny bit too cool previously, if that makes sense? She’s going through some stuff in the game, but she’s really the only person in the games that doesn’t have real flaws they’re trying to work through, so I appreciate that we got to see her a little embarrassed (those YouTube videos are too cute!) and not excelling at something. She feels more like a human person and less like an imagined Ideal Teen now, and I always love me a flawed character. Lisa: Amanda was 100 percent her delightful self, part geeky, tech-savvy smarty and part goofy nerdy genius. (I saw that Evangelion/Linkin Park MV on your social, Manda Panda!). I love that she was allowed to be well-rounded here and anxiously overwhelmed with her inability to master the art of acting; as confident as she is in the game, she is only seventeen, and the issue captured that well. Kate: I love this new Amanda we saw here who has morphed from disaffected “cool girl” to nerdy fangirl. I’m curious if that’s because of the fan reaction to her after the game came out. Like, I think Amanda resonates with a lot of their fans. I was definitely an Amanda growing up, and so I like her better here in the comic than I did in the game, to be honest. Alenka: That panel with the close-up of Amanda’s judgey, tortured eyes and the little Dad heads whining about loud commercials was EVERYTHING. I loved seeing her perspective shared in a different way than the game, which obviously is all about dialogue. 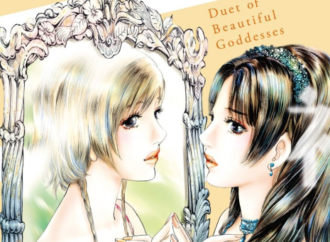 Her teenage embarrassment and overconfidence shine through the story in smaller, but significant ways. I love it. Last issue’s review revealed that many of us love Robert. Like, a lot. Melissa called him a whiskey-soaked marshmallow. So, let’s talk about Robert in this issue. Melissa: Robert is my favorite, because I didn’t expect to like him. I am not the bad boy type. However, I too love cryptids and film noir. I too get wrapped up in whatever niche thing has caught my interest at the moment, sometimes to everyone’s detriment. And he’s so playful in this issue! It’s nice to see him having a good time and making connections and running away because apparently he’s overcome at the sight of Craig shirtless? But like, fair. Lisa: I died laughing when Robert just APPEARED in the Coffee Spoon without Mat even knowing he was there. Because of course his Cryptid-hunting self would know how to stealth. Also, I loved him in director mode, being bossy, talking about his love of neo-expressionism. And crying while saying that this is exactly how Nora Ephron must’ve felt! 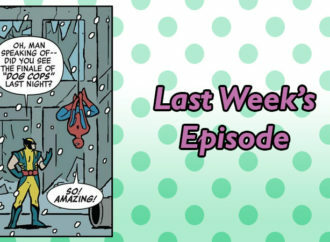 Kate: After Robert’s incredibly nerdy POV storyline in the previous issue, it was really interesting to be outside of him watching him do his weirdo thing again. I think I was surprised at how quickly he took charge, and in some ways moving from Robert thinking of his life as a neo-noir film in one issue to having Robert actually channel his film knowledge into making a commercial was nifty. Alenka: My love for Robert is neither surprising nor unknown, and this issue of course made me love him more! I have to echo everyone and say that I’m enjoying seeing his nerdier side. His storyline in the game is so much about his emotional journey that we don’t get to see him being so openly and absurdly himself. I’m glad that the writers have latched onto the idea of Robert’s friendships outside of Mary and Dadsona. Seeing him not just be kind and loving toward Mat, but also understanding his needs and working to meet them is really heartening. Such growth! Can we also talk about the fact that Robert made Craig take off his shirt and then sweat-dropped and blushed and literally fled the scene when Mat asked him why? Lisa: I adore how the comics keep the multi-shipping fervor of the games alive! Like, by the end, I was fanning Mat/everyone. Kate: I legit think Thirsty!Robert is my new favorite thing. Alenka: ALSO, in Damien’s vision of the commercial, Mat is shirtless and brooding. At what point does Maple Bay open up to polyamory? Back to overall thoughts about this issue? Melissa: It was really cute! I do wish there was more Mat, though? Mat and Hugo are the two dads I, real-life Melissa, would have very real crushes on. 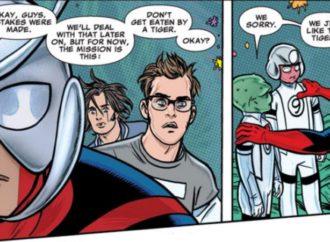 I love that this issue is about everybody getting together to do something nice for Mat, who is a coffee-soaked marshmallow, but I wish I got to see a bit more of him in it. I love that boy. Lisa: I loved the little tiny geeky details revealed about Mat’s inner life, but I agree it was kinda multi-dad heavy, about how everyone feels about Mat versus Mat himself. Yet, everything each dad added to the action really worked to make it sing. Vernon’s always said that Mat is the most like him, with his social anxiety and love of music, so perhaps it’s harder for him to see him from an insider perspective? Kate: I think that’s accurate. Like, it was definitely a multi-dad story (and there was a lot of Amanda in there too), and while that’s great, I don’t know much more about Mat now than when I started, other than he doesn’t want to be on camera and he plays bizarre instruments in his spare time. It was definitely an enjoyable read, but yes. Give me more Mat! Alenka: I agree that Mat doesn’t feel very present in an issue about him. It’s interesting that Robert’s obsessive nerdiness steamrolls over Mat’s anxiety. Both are typically quite reserved, albeit for different reasons, but it’s easier for Robert to get loud and self-obsessed than it is for Mat to step up and ask for what he needs. He’s also the owner of an establishment focused on community and customer service. Mat’s a helper, and he naturally wants to give way and let situations focus on other people. I’d love to see him asking for something he wants or needs in a future issue. We haven’t talked art yet, so we should. Melissa: The art in this issue is really cute. Jarrett Williams’ style isn’t exactly my cup of MGMTea, but I think it’s perfectly suited to the story that’s being told. It’s expressive and cartoony in a really delightful way. It feels very much like watching a modern cartoon, which gives the issue this sense of exaggeration that works really well. The story’s a bit silly (in a good way! ), and the art matches its tone. There’s a lot of cute little sight gags in there too, and I’m excited to reread it and pick up on more of them! My favorite panel is Damien’s vision of Beefcake Mat with a rose. Or maybe Mary’s face as she spritzes Craig’s chest with water. I don’t know, they’re all great! Lisa: I loved how bubbly and bright and cartoony it was. It was very old fashioned and reminded me a bit of Fleischer-style cartoons! My favorite background gags were definitely the jokes on the chalkboard written out in the various dad’s handwriting during their brainstorming session (NO UKELELE MUSIC) and the cameos in the line at the coffee shop (both of the Game Grumps, as well as Leighton, are visible in the line). Kate: It’s the most cartoony and cute art we’ve had so far, but I think like Melissa and Lisa have said: it fits the story that it’s telling. 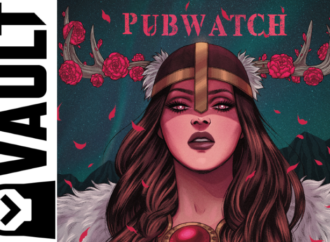 We’re three issues in now, and each issue I get more appreciation for Ari Yarwood’s conception of this series and the diversity of creators who were brought into it. Like, I would probably love any Dream Daddy content I was given, but now I’m looking back at the whole series so far and really liking how it’s been put together. It makes it feel almost like a fanfiction anthology zine, and I’m here for it. Alenka: I love the over-the-top, almost caricature style of the comic! As everyone has said, it works well tonally with this story, but it also emphasizes the silliness of the Dream Daddy world. 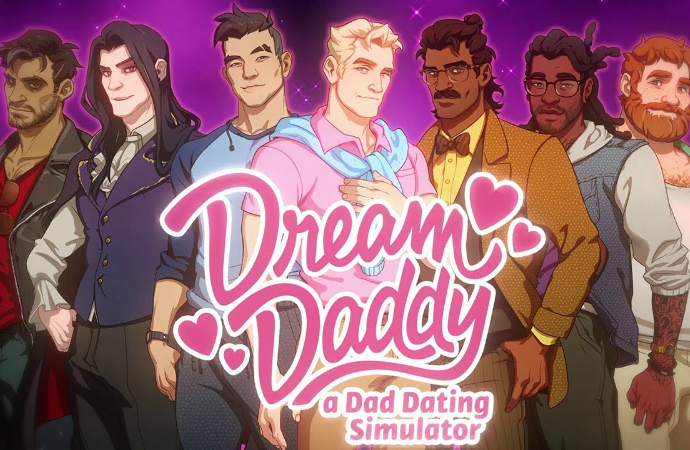 There are so many stories about grief, trauma, and healing in this sweet series about hot Dads, and I love those aspects, but I also want to celebrate the absurdity of Dream Daddy. Jarrett Williams’ art is very loving, loud, and celebratory, just what I need knowing that now, with the Dadrector’s Cut, I can also dive back into the serious stories! Kris Anka Cover, Dream Daddy #3, Oni Press. Melissa: Did I mention that Mat is one of the Dream Daddies I would have an actual IRL crush on? Lisa: Super hot as always. I also died at the texts being from Leighton and Vernon on the sidebar. There’s no shame in thirsting for your own characters! Kate: I’m a sucker for fake social media art in comics (I blame McKelvie and Gillen’s Young Avengers run), so I feel like this cover was made specifically for me. I’m okay with that. Alenka: Yes, the casual nature of Mat’s pose and the way he oozes coolness is just … I like this a lot more than shirtless Craig? I also might be a sucker for Mat’s tattoos. 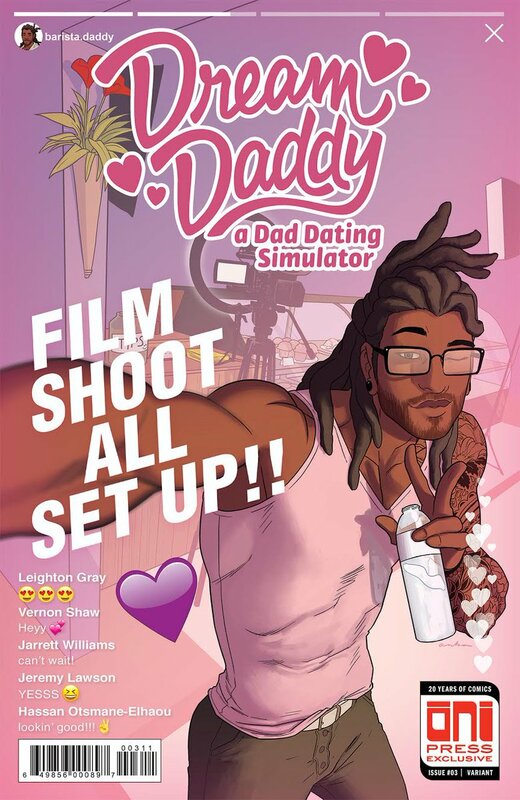 Included in the backmatter is the cover for the next Dream Daddy issue. What do you think? Melissa: I think … YES. Monsters? Yes. Rivalry? Yes. Will I get to see more of Joseph being a trash bag? Please. Brian is too good for this world; I hope he wins whatever bizarre competition is happening on that cover. Lisa: Brian versus Joseph monstery rivalry! 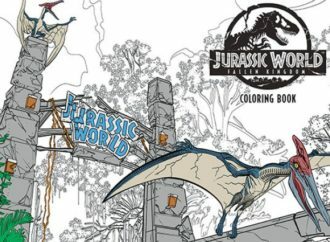 I don’t know if this will directly hook into what’s happening in the storyline, but I’m loving the concept. Kate: I have no idea what’s going on, but I love it. Alenka: I am excited for something weird and wild to happen. Brian is my least favorite dad, and obviously, I don’t love Joseph, because I’m not really supposed to (although I do think his story is interesting, well-written, and I enjoyed playing it), Mad science! With … Dads who are not scientists! Let’s do it. There’s only two issues left. How will we ever cope? Melissa: Fanfiction? But for real, please do more of these comics; they’re such a delight. It’s a lot of fun having issues be standalone, but taking place in the same universe. I think they’re unusual, but also kind of a fun way to introduce people to the medium. Look at how this other medium can enhance the thing you like! Of course, few comics are done precisely this way, but it honestly feels like fanfiction, and I love that about it. Keep it up! Do Dragon Age next, but like, exactly this way and not the big epic story way. I have extremely specific needs, and it’s this. Please Oni! Lisa: Probably by writing all the fanfiction. I’d love to know how the sales are, because this has been enchanting. Kate: I mentioned that in reflecting on the series it really does feel like a fanfiction zine anthology, and I LOVE THAT. Oni’s announced the first volume trade, and I really, really hope that they’ll do more Dream Daddy issues and also what Melissa said: do this format for other adaptations! Why stop at Dream Daddy? Give us all the quality content. Alenka: I mean, I’m probably going to cope by playing the Dadrector’s Cut and seeing what’s different? Also, as someone who doesn’t play a ton of games, I would totally read one-off tie-in comics for games I hear about on twitter. Like, I don’t really know what happens in Overwatch, so if you give me random comics about it then I might as well jump in and see if I can learn what all the hubbub’s about.